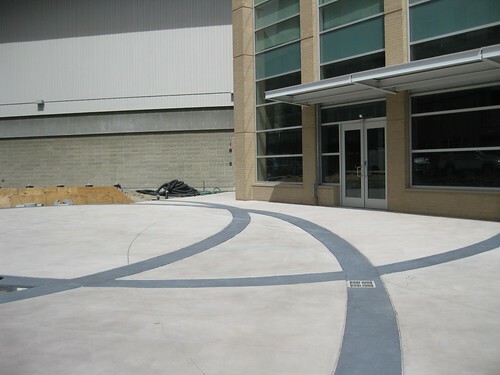 I have bemoaned before that the south plaza* at The Dunk (the entrance facing the Hilton) was unfinished and sad. 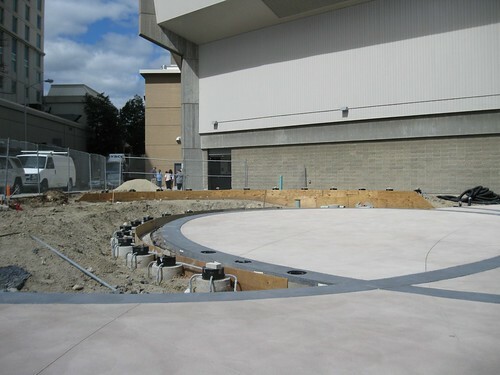 Thankfully, the last several weeks, work has been going on to finish the south plaza. There has been all sorts of fencing blocking the view of what they were doing, but today I was able to get a good look at it. Obviously no landscaping is in yet, but already it is an improvement. The curved lines are remeniscent of the sidewalk treatment between the Convention Center and the Westin, I’m assuming that is purposeful. 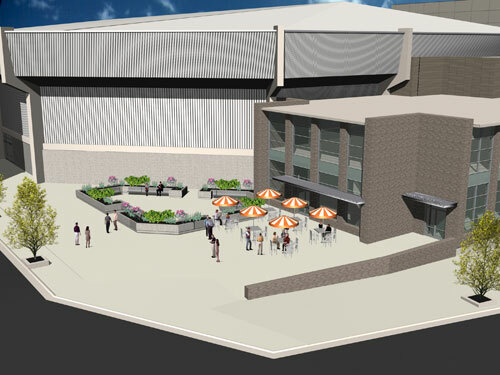 This is what the renderings showed of the south plaza when The Dunk was being redeveloped. Obviously they are doing something different, but it would be nice if those umbrella tables carried through to the new design. We’ll see how it develops as they finish it up. *I don’t know what that area is called, if it even has a name, I call it the south plaza, not too original, I know. Nice! Now all we need is a marque to tell us what events are actually happening there! I usually figure out what is at the Dunk by looking at what they charge for parking.. $10 bucks = friars, bruins, $20 bucks = circus or disney on ice, 30 bucks = big events like Justin Bieber or American Idol stars. Usually I am not too far off. I had to chuckle about the parking charge correlation with event scale. BTW, what’s up with the north side stairs? They’ve been messing with them for the last two weeks. I don’t know, they’ve got really weird looking grey paint on them now. Hey, Jef. Actually, this is the site of the newest work of public art, a piece commissioned from RISD professor and landscape architect Mikyoung Kim through the State’s public art program – managed by RISCA (the Rhode Island State Council on the Arts). It’s slowly taking form, and we hope you like it. “During the day, a lighting element underneath the screen would cause these tiny glass elements would glow red and orange, while at night the color scheme would change to blue. According to Kim, the sculpture serves a dual purpose | providing a striking centerpiece for the park, while bringing some much-needed light to an area that is shaded for much of the day. There will also be several plantings in the area, making it a true urban park (albeit, a “pocket park”). Thanks for the info Randall. That all sounds wicked cool. Before the renovation, the area here was actually a nice little pocket park, it wouldn’t have ever won any awards, but it was actually a nice space that no one ever used because it was so tucked away and unnoticed. Actually, it probably seemed dangerous. The design you describe sounds like it will very nicely solve those issues.